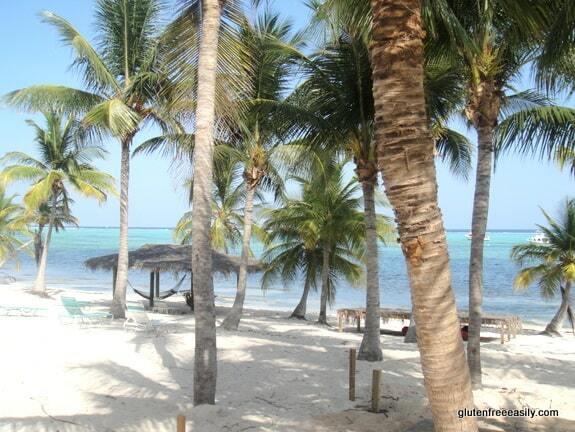 Okay, first things first, a few pics of where I am this week, Little Cayman Beach Resort. Gorgeous, isn’t it? 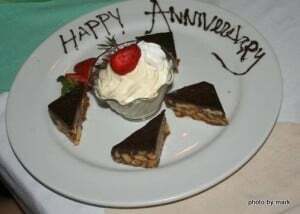 And, we were treated so very well on our actual anniversaryby the chef and staff, and, of course, the wonderful group we are with—Mr. 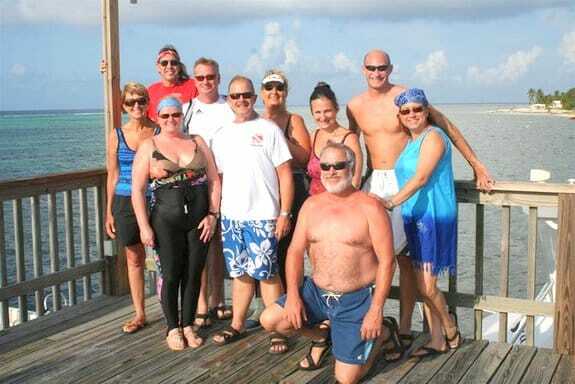 GFE’s dive buddies (pictured below)—who arranged our special celebration. I’ll share much more later, but need to get in some beach time as we’re “leaving on a jet plane” tomorrow. Well, actually first we’ll hop on a little 12-seater plane called The Otter. Okay, maybe not “hop” on … maybe “squeeze” is a better word. But, as the saying goes, it’s all good—in this case, it’s all really, really good! Have you heard? There’s a gluten-free gourmet getaway coming up in beautiful Vermont and it’s only a month away—July 15 through July 18. Imagine a long weekend filled with gluten-free goodness, a focus on wellness, and, best of all, new friends. We often visit friends who live in this area on our northern motorcycle trips. I can assure you that it’s a gorgeous and wonderful place to visit. Since I’m on vacation currently and have trips planned for August and October, I’m not yet sure if I can attend, but I sense my brain working overtime to try to make it happen. After all it’s being held on my birthday weekend! Check it out and let me know if you’re going … you just might inspire me to do some “finagling” and somehow make the commitment! Incidentally, transportation from New York City is included. Read all about it here … I know you’ll want to attend! My blogging buddy, Pete (No Gluten, No Problem), is participating in the Virgil Crest Ultra Race. In Pete’s words, “the race covers 50.1 miles, and climbs 9,000 vertical feet. That’s the equivalent of basically running back-to-back marathons, and climbing to the top of the Empire State Building 7.5 times while you’re at it!” I know … wow! He’s decided to make this event a fundraiser for the National Foundation for Celiac Awareness (NFCA). I’m sure many of you are familiar with the NFCA and all the immeasureable gluten-free good that it’s done since it was founded by Alice Bast in 2003. (The NFCA is on my gfe’s other resources listing on my sidebar and I’m happy to be listed on their site as well. I called upon them recently for resource materials to share during a celiac/gluten intolerance awareness presentation. They immediately responded and their materials were a valuable addition to the information package that I provided folks.) So, Pete’s asking for your support through his NFCA fundraising effort here. And, incidentally, you can follow Pete’s training progess at the NFCA site under Athletes for Awareness or on his blog No Gluten, No Problem. My sweet and lovely friend, Iris (The Daily Dietribe), has the roundup of the Adopt A Gluten-Free Blogger event up! Not only did Iris do a beautiful job, but so did everyone who participated. Be sure to check out all the entries here. (You’ll want to hang around and visit a while, too. There are amazing recipes like this one for Sweet Sesame Noodles.) The info on the June adoption event has not yet been announced. I’ll share it when Sea (Book of Yum), the event’s creator, announces the particulars. Storytelling is important in all genres and areas, but it’s particularly critical in the celiac/gluten intolerance/gluten sensitivity arena. With so many folks fighting gluten-caused symptoms/conditions with no diagnosis in their immediate future, it’s often the personal stories of others who have received a diagnosis or found healing through the gluten-free diet that allows the undiagnosed to see the path they need to take. In that light, I feel that two recently posted stories need to be shared with as many folks as possible. The first comes from one of my very favorites, Kelly, at The Spunky Coconut. It’s the story of her younger daughter’s amazing (and ongoing) recovery and is simply titled, Recovering Ashley. The second comes from my fairly new and wonderful friend, Kim Wilson-Maes, of Cook It Allergy Free. She primarily shares the story of her son in her post, Our Family’s Neurological Link to Gluten. Both of these stories will make you cry and rejoice, and cry again thinking of these children’s struggles, their mothers’ incredible determination to find answers and their ultimate success, and especially those who remain struggling and looking for answers. Please also read the readers’ comments as share additional encouraging stories of recovery. Kim Wilson-Maes, in conjunction with her husband, Kurt, also happens to be the creator of the new iPhone/iPad/iPod application that’s getting all the buzz in the allergen-free world. Their app allows you to easily custom tailor recipes to meet your specific needs due to food allergies/intolerances. You can read about it at her site here. It was also mentioned recently on the BeFreeforMe site in this post. I really love this concept because the focus is on recipes versus products. If you’re at the grocery store, you can pull out your iPhone and use Kim’s application to find a great recipe for the pork roast that’s on sale, with the shopping list right there with the recipe–neat idea, huh? And, even better, if the recipe calls for dairy and you’re dairy intolerant, you’ll also be able to readily access successful non-dairy substitutes. Don’t have an iPhone, iPad, or iPod, yet? Me neither. But not to worry because Kim is seeking terrific recipes for her application and giving away an iPod Touch at the same time. Check out her giveaway here. If you like my gfe recipes, you’ll be happy to know that a bunch of mine will be featured on Kim’s app. I’m so honored! The recipe submission and iPod Touch giveaway ends June 25–all the info’s right here. 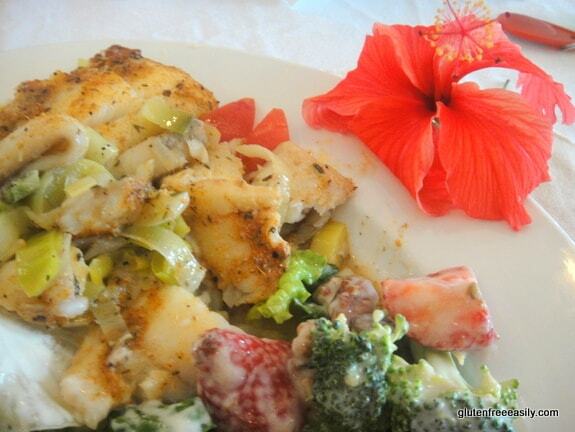 Carrie’s 30 Days of Quick and Easy Meals is continuing on at her site, Ginger Lemon Girl. Some of my favorite gluten-free bloggers, including Carrie herself, are sharing their best, 20-minutes or less meals. And, there are also several brand spanking new bloggers with terrific meal ideas. There’s Ellen’s Tomato Soup (plus more! ), Erin’s “Not Really a Recipe” Pork Chops, Claire’s Asparagus Salad with Strawberries and Maple Tahini Dressing … just to name a few of the participating bloggers and their recipes shared. Carrie’s event is such a terrific one for all of us! Dynamic Diane’s (The W.H.O.L.E. 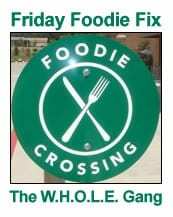 Gang) Friday Foodie Fix is back! This week she’s asking for Father’s Day favorites. Next week, the secret ingredient will be a summer favorite—raspberries! Last, the winner of the Bagels, Buddy, and Me giveaway is up on my Out and About page! Just added … our beloved Gluten-Free Girl, Shauna, has auditioned for her own show on the new Oprah Network! (She shares the experience in her latest post.) Oh, the thought of a gluten-free cooking show with Shauna—and Danny—at the helm … love that! You can vote for Shauna here. I always love your summaries of fun stuff! I hope you’re enjoying your vacation! Hi Alta–Thanks so much! It’s always nice to hear that folks appreciate this (mostly) weekly summary that I do. 🙂 I had to go back and add the info on Shauna auditioning for Oprah’s new network … did you hear that? Very, very exciting! Also, thank you for telling people about my post on Ashley. It is so good to share our struggles and progress. Hi Kelly–Thank you so very much! It was an amazing little piece of paradise. Traveling and having new experiences with family and friends is truly one of the most joyous things in life. 🙂 Can’t wait to hear more about your trip … especially since I’ve never traveled in that area. I think about Ashley’s recovery/progress and your family’s story very often. I know your story will help many. Sending you the very best thoughts for continued healing every single day! I hope you are having a wonderful time on your anniversary. It sure sounds like you are. Thanks for all of the wonderful info. Lots of mental notes to make. Oh, who am I kidding, I need to write it down. While the Vermont trip sounds wonderful, I will actually be celebrating my birthday on the other side of the country. I found a B&B in Napa that caters to those with food allergies/intolerances. I’m excited to try it. Sounds like we were born close to the same time. I will keep checking back to find out about adopting a gluten-free blogger. I missed last month’s because I didn’t know it was being guest-hosted. Figured it out just as it was ending. Enjoy your vacation! Thanks for being around. You really are helpful and make things easier for those of us trying to figure the gluten-free world out. Hi Tia–LOL on writing the notable events down. I hear you, sister! Hey, how cool is that to share the same BD weekend! 🙂 And, that B&B in Napa … I’ll be looking for your review on that one—sounds fabulous! As soon as Sea posts the info on Adopt a GF Blogger, I’ll put out the word! Yes, Sea often tries to have guest hosts. Finally, thanks for the very sweet compliments. I’m not exaggerating when I tell you that they mean the world to me. Looks like a wonderful place to celebrate. Happy Anniversary! Hi Heather–Thank you! 🙂 Yes, so wonderful and relaxing. Back home now, but so glad to have had the anniversary trip there. Happy anniversary, dear Shirley!! It looks that you & everybody else had so much fun! What a lovely post to read this was!! Thanks Shirley! I’m not sure if anyone’s signed up to do Adopt A Gluten Free Blogger this month, but I hope so because it’s fun! Wasn’t Shauna’s video great? I would love to watch her and Danny cook and visit friends and do it all gluten-free! What a beautiful place and Happy Anniversary! Thanks for the weekly update. I was just wondering about the Adopt-a-Blogger. I’ll look forward to your update on that one! The getaway is so tempting for me too. I need to think on it for a bit. If we don’t make this one I think we should plan our own! Hi Maggie–Thank you, dear! It was a very lovely trip. I really enjoy these news posts you do. This is the kind of news that is helpful to me. I like how you mentioned the stories. That is one of the things I like best about our Celiac support group. It’s not just that we all can’t have gluten, it’s that we all had some unexplained helath issue that we had to deal with that no one else had and doctors just through their hands up for years. We can all appreciate each others stories. Thank you, Tracee. 🙂 I always try to share what I find of interest and helpful, so it’s nice to hear that my gfe readers find these posts worthwhile. And, great point about your support group! Support groups provide so much more than recipes, speakers, etc. They are multi-dimensional and such valuable resources. I’m convinced that it’s these stories that are educating folks and getting them diagnosed (by a medical professional or self) and on the path to good health! Oh, so jealous. 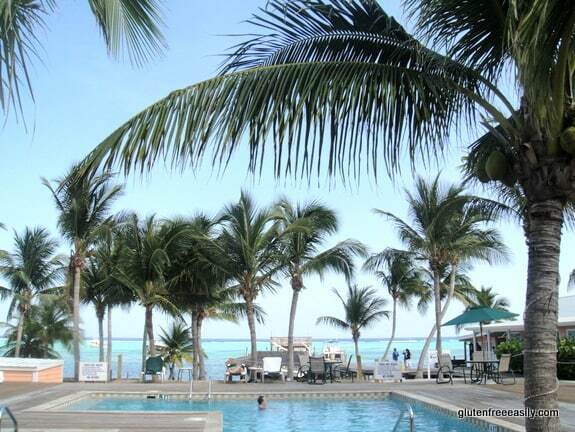 The family and I went to Grand Cayman two years ago. One of the best family vacation we have had. Thanks again for the shoutout Shirley!! 🙂 I hope you’re having a wonderful time!! Shirley, your pictures bring me right back to our trip there! It looks so heavenly! I just got to reading this post! We decided to do a last minute getaway to San Diego for Father’s Day, and I pretty much unplugged myself from the computer. Does not happen often, but it was such a nice break! What a wonderful post. And I thank you so so much for sharing Conner’s Story. Even if his story and journey to diagnosis helps one person, it is worth it for another parent not to have to go down that path. Hope you are recovering from your travels! Hi Kim–I’m so glad you had a last-minute, unplugged getaway … sounds fabulous! I’m so happy to share your son’s story and a description of your app–both have the potential of helping so many. That’s always my goal here at gfe. 🙂 Thank you for the extremely sweet words! p.s. I’ll be sharing lots more photos and eventually my review of the resort and food. 🙂 How nice that these few photos took you back to LC for a moment! Wow, what a vision of paradise! Would love to hang out on the beach, read trashy novels and sip some exotic drink (beet smoothie, maybe). Looks absolutely lovely, Shirley. Although I can’t complain as it’s pretty lovely where I am as well. I’ll be looking forward to the complete review and photo series!